The November 2016 LookFantastic Beauty Box has been themed #LFSparkle - to make you "shine bright for the party season". The products within will give you glowing skin and glossy hair. 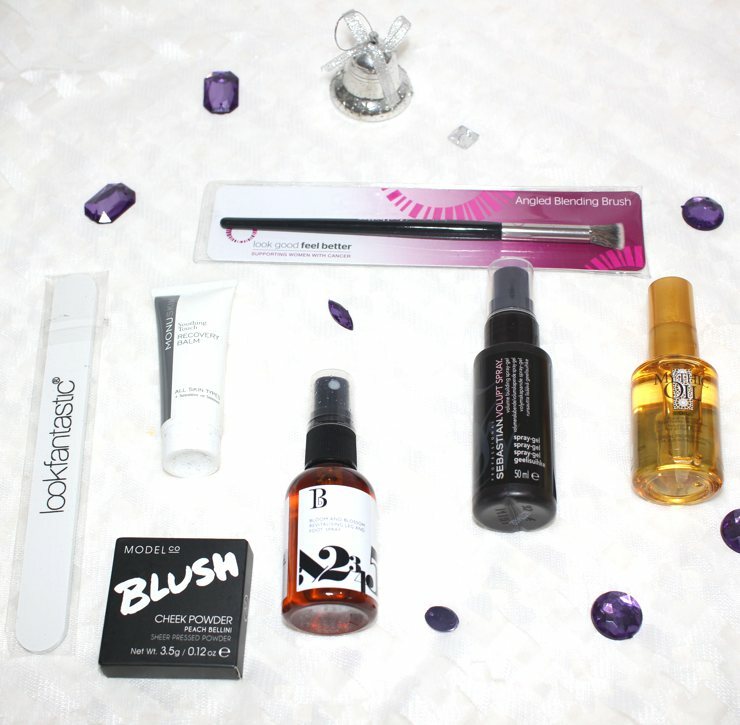 And, best of all, this month's box contains seven products, rather than the usual six. The box comes with this month's Elle UK magazine, with Amy Adams on the cover. TMI: I used to have a girl-crush on Amy Adams and Jennifer Aniston. I love the packaging this month - it is beautifully winter-themed and the sparkly snowflakes make it a keeper. 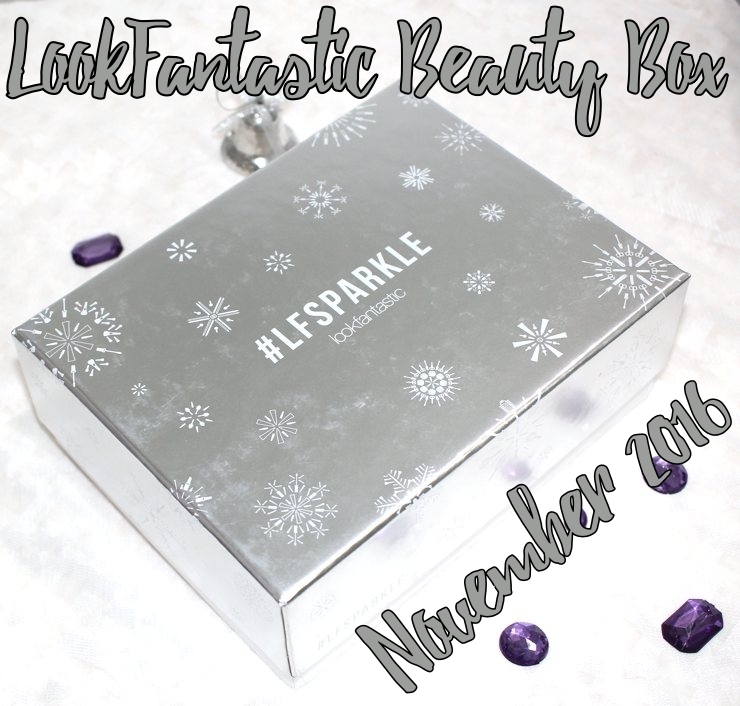 Scroll down for the contents of the LookFantastic Beauty Box for November 2016, themed LF Sparkle. 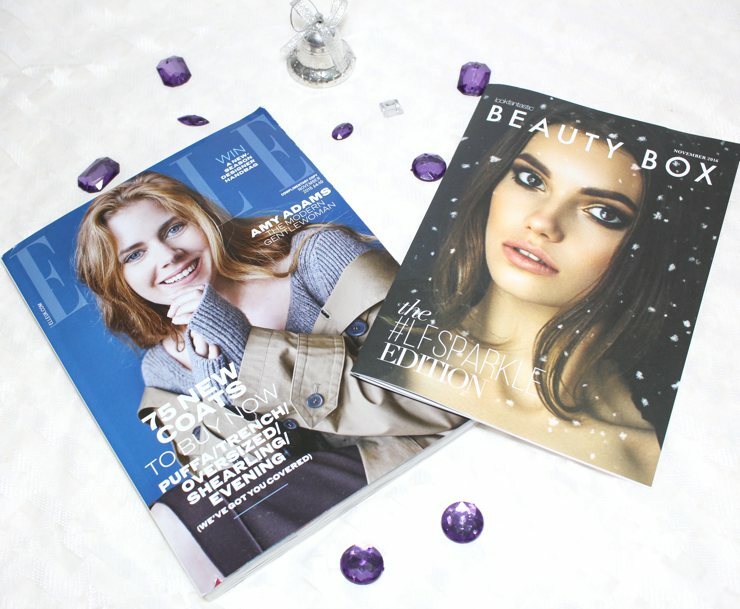 The Elle magazine and the Beauty Box magazine are great reads this month. This lightweight hair oil contains avocado and grape seed. It is supposed to keep hair smooth and frizz-free. That last one alone has my attention. This seems to be a very generous bottle at 30ml - full-size is a whopping 100ml. Can you imagine how long that will last, given that we only use a smidgen of hair oil each time? I used this once this morning, on dry hair - it smells great and did a good job keeping my hair untangled. A skin saviour for colder, drier months. Contains rose essential oil, blackcurrant seed oil, and evening primrose oil, and peptides. Leaves skin soothed and balanced. Sounds brilliant. I can use all the moisture I can get, after four years of benzoyl peroxide (yes, big idjit; I know). If Monu is new to you, it was founded more than 25 years ago, and the products are made in Cheltenham Spa, UK. Pretty much every Aussie kid I went to Uni with swore by ModelCo. At the time, I wasn't into makeup (idjit!) - if only I had bought a bunch of their products back then. I got the shade Peach Bellini - it is perfect for my skintone. I have reviewed these brushes here. You can never have too many blending brushes. What I love about this brand is that they support women and children who are undergoing chemo. I got another one in my LookFantastic Advent Calendar, and I bought a set, so I might add this to the giveaway box. Not only is this a nice hydrating spray, it also relieves tired legs and contains horse chestnut and yellow sweet clover to alleviate water tension. I'm giving this to my Mum, who has ankle troubles. This uses "cushion particle technology" to lift hair from the roots and amp up volume. It is a bi-phase formula. Currently, my hair is short and I have tonnes of volume/bushiness at the crown, but my ends tend to fall flat through the day. Will try this out and see if I can get the bouffant to stay. This glittery nail file seems to be a bonus item. I'm always, always misplacing nail files and emery boards - the things just vanish into thin air, I tell you! So it is good to have another one. Until it disappears into oblivion. 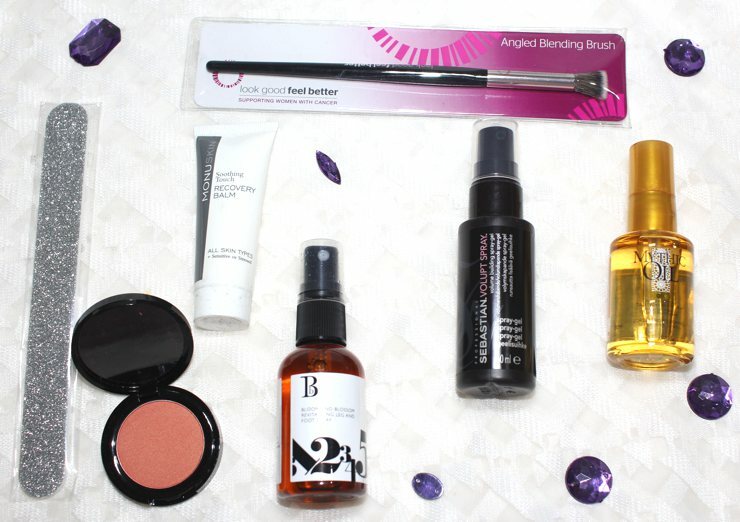 I love this box - I can use everything; there are two full-sized makeup products (the blush and the brush), and everything else is also generously sized and well-curated. I hope they continue with the makeup inclusion, and keep sending full-sized products. I also hope the Elle mag is sent out in 2017 as well. I can't wait for the December box - am sure the packaging will be Christmas themed. To subscribe, go here. LookFantastic ships worldwide. A box costs £15 or £11.25, depending on how long your subscription is. You don't need to pre-pay; they only charge while shipping your box out. These also make fabulous gifts that keep giving through the year.